A Mardi Gras Celebration | Kid Reporters' Notebook | Scholastic Inc.
Mardi Gras is French for “Fat Tuesday.” Traditionally, Mardi Gras celebrations, feasts, and parades are held the day before Ash Wednesday, which is the first day of Lent in the Catholic religion. The celebrations offer a last chance to indulge in merriment before the solemn season of Lent begins. Mardi Gras celebrations are held in several regions in the United States. Louisiana is arguably the best-known location for such festivals. The city of New Orleans, which held its first parade in 1699, draws hundreds of thousands of tourists to its parade each year. Parades are usually organized by groups that are known as krewes. Each krewe has its own name, parade theme, areas of community service, groups of floats, and even a royal court. This Mardi Gras season, I was invited to participate in the second annual Children’s Parade in Bossier City, Louisiana. The parade was coordinated by Helen Phares, who is captain of the Krewe de les Femmes Mystique. “We created this event to offer children a fun, safe, family-friendly way to celebrate Mardi Gras,” Phares said. The parade route circles a mall. Nearby streets are secured so that children are safe from outside traffic. The adults who work at the event and ride in the floats have loved Mardi Gras since childhood. Veronica Cook, who works with the krewe, said that it often takes several months to prepare a float. A favorite float for kids this year was Nemesis I, a replica of a pirate ship. 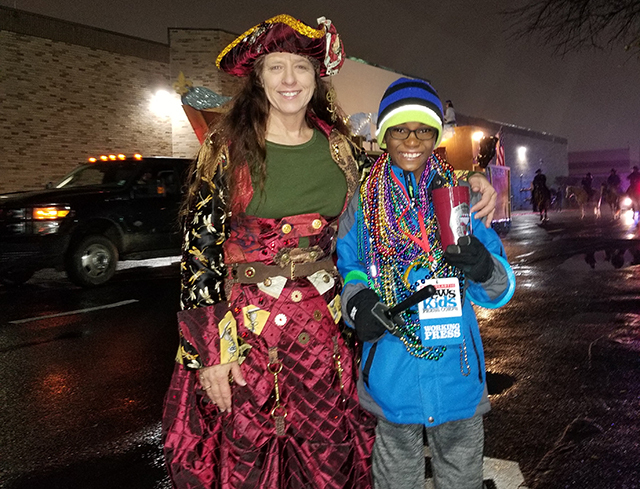 Owen attends the Mardi Gras parade for children in Bossier City on February 12.